Slowhand has picked out some more choice item from his personal gear collection to be sold in aid of the Crossroads rehabilitation centre. Guitarist brings you the key pieces ahead of the auction at Bonhams on March 9. A guitar legend on his hero and his role in narrating a new DVD about him. We take your guitar questions to Mark Tremonti and Myles Kennedy and learn much more than we bargained for. Guitarist Daniel Kessler discusses the unique guitar approach behind his brand of brooding indie music. Four classic Fender models get a humbucker makeover. We bring you the best of the best guitar gear we saw at the Anaheim show. 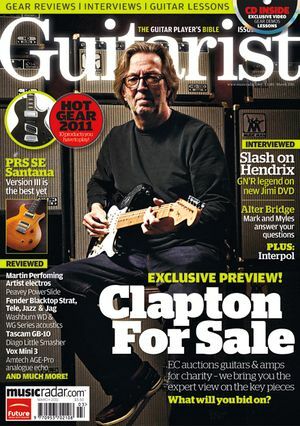 Guitarist issue 339, on sale in the UK now.